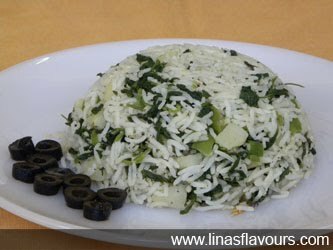 Fenugreek Rice is a combination of pungent taste with ingredients like fenugreek leaves, garlic, green chilli and black pepper. How ever boiled potatoes give it a little soft and creamy consistency. While lemon adds some aromatic twist in taste and flavours. Take kadai/wok and heat ghee. Add curry leaves, garlic paste and stir it for 2-3 times. Add potatoes and fenugreek leaves. Saute it for about 4-5 minutes. Add salt, pepper, lemon juice and cook it for about 2 minutes. Add cooked rice and cook it for 2 more minutes on low flame so that all the spices mix it well. Serve it hot with curd/yogurt, raita(condiment made with yogurt and vegetables or fruits) or curry.